Tom Baker is the Doctor, and Peter Davison is the Doctor, and Colin Baker is the Doctor, and Sylvester McCoy is the Doctor, and Paul McGann is the Doctor, in The Light at the End. Imagine that it’s a milestone anniversary for Doctor Who. For multiple decades, the show has been an ingrained part of British culture, to the extent that millions of Britons have an actor they consider “their” Doctor. But, instead of a large, boisterous celebration that proudly proclaims the robust status of the franchise, the BBC instead produces a low-budget two-parter that barely clocks in at 15 minutes total. In order to make it to air, the show had to cross-over with a highly successful British soap opera. The production of the anniversary special was so intertwined with the soap opera, the BBC set up a phone line where fans of the soap opera could vote to determine which character from the show would save the Doctor from the machinations of the Rani, with all the proceeds going to charity. And, let’s say that the first part of the serial was broadcast during an annual charity telethon, and the second part was broadcast during a popular variety show, but the host of the variety show asked that some time be trimmed off of the broadcast, and the BBC readily agreed, causing several key lines to hit the editing room floor and the serial to lose any sense of a complete and rational narrative. That, my friends, was Dimensions in Time. Not so much as a celebration of the show’s 30th anniversary, at times it came off as the BBC’s way of saying “there, that should shut those bugger Who fans up” with the lack of proper funding and their willingness to shorten the story to fit the whims of a television host. Even with the cards stacked against them, the two episodes of Dimensions in Time scored some of the highest television ratings in the entire history of Doctor Who, showing the BBC that there still was a rabid, dedicated fanbase out there for the franchise. Compare the BBC’s production and handling of Dimensions in Time with the way they promoted the 50th anniversary of the show. A full 90 minute serial with not one but TWO Doctors, along with a Doctor played by an Academy Award nominated actor; a Doctor never directly mentioned in the show’s history that, over the course of the story, became an integral and intriguing part of its mythology. The Day of the Doctor was simulcast in 75 countries, along with being shown in theaters a week later as an extra treat for the fans. The BBC put on an all out media blitz to go along with the broadcast; posters, adverts, trailers shown both online and in the theaters, and even commissioned a mini-episode that showed the regeneration of the Eighth Doctor into the War Doctor, this time giving the fans something they truly wanted to see instead of holding their noses as they threw them a bone. And the fans even got a little treat as several classic Doctors and companions got together and filmed a true love letter to the old show, The Five-ish Doctors. The thing that kicked the whole 50th anniversary celebration off, however, was a release from Big Finish. Where The Day of the Doctor celebrated the revival, Big Finish’s contribution was a celebration of the classic series. Having helped carry the torch of Doctor Who since 1999, Big Finish’s anniversary story sees five Doctors, along with four television companions and one audio companion, come together to fight the Doctor’s greatest foe, with nothing less than the Doctor’s very existence at stake. 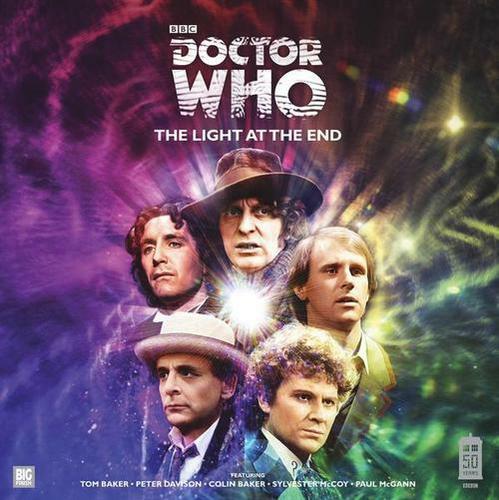 The Light at the End is a grand adventure that showcases Big Finish at its best, paying homage to the actors and actresses that have been, at one time or another, been part of the Doctor Who mythos in a respectful manner that embraces the very best of the beloved franchise. …but not her TARDIS. For inside this TARDIS waits a grinning madman in a long scarf, and his savage companion. Who also want to know the story behind the flashing red light that has appeared on their console. Big Finish’s last attempt at a multi-Doctor anniversary story was Zagreus released to coincide with the show’s 40th anniversary in 2003. That story was a jumbled mess with a bloated run time, with a cast too large to handle, metaphysical imagery, continuity references galore, and an overall sense of celebrating the mythology of Doctor Who instead of celebrating Doctor Who itself. In comparison, The Light at the End is a stripped down story, clocking in at just under two hours as penned by one Nicholas Briggs. Nicholas Briggs is a name well known to Whovians. Not only has he served with Big Finish since its inception, serving as director, producer, and showrunner for the various audio lines, but he’s been involved with the television series as well, as the Daleks, the Cybermen, the Judoon, the Zygons, and the Ice Warrior have all been voiced by Briggs. Briggs has also penned several audios, including Sword of Orion, The Mutant Phase and Embrace the Darkness. On the whole, Briggs’ story work for Big Finish has tended to produce serviceable stories; decent outings with a memorable character or moment, but lacking those key moments or plots that elevate them to great stories. There are exceptions, however, such as Creatures of Beauty, To the Death, and now The Light at the End. Briggs gives us a plot that is straight forward and easy to follow while sprinking in those awesome moments and plot twists that elevate the tale. Even as the Doctors and companions spend the first hour scattered across space and time, the common thread of the flashing red light quickly begins to bind them together in the second hour. The story is also accessable to casual listeners who have only seen the new series, fans of the classic show who have been away from the franchise for a while, and even those who have never listened to a Big Finish audio before this release. There are very few references to past episodes or events, and with regards to the presence of Charley Pollard, an audio-only companion, the only reference to her background is a comment that she stowed away on the R-101 before joining the Eighth Doctor. More importantly, the script gives each individual Doctor a chance to shine on their own, each one discovering an individual piece of the master plan and larger puzzle, before bringing them together for the mandatory all-Doctor-team-up near the end. Whether the story originally called for these two specifics Doctors to come together early in its runtime, or if it was just more convenient to get the two actors in the same studio at the same time, pairing Paul McGann and Tom Baker was a masterstroke and a great way to kick off this multi-Doctor story. The chemistry between the “oldest” Doctor and the “youngest” Doctor is instant, Bohemian and Romantic immediately realizing someone is breaking the First Law of Time (A Time Lord is not allowed to meet their former or future regenerations) and diving headfirst into solving the mystery. The listen can tell that Baker and McGann are having an absolute ball. The banter between them is snappy, natural, and at times, absolutely hysterical. Eight – That can’t be our TARDIS. Unless one of us bothers to fix the chameleon circuit. Four – Could we really become that vulgar? Eight – I certainly hope not. As opposed to the bored performance McGann gave in Zagreus, where shouldered a good bit of that serial’s runtime by himself, here he instantly plays off of both Charley and the Fourth Doctor with his wide-eyed inquisitiveness and knack for diving right into the problem without a plan. Tom Baker is the perfect foil to McGann, a Doctor who also enjoys meddling where he’s not supposed to, his sarcastic wit and charm a counterpoint to Eight’s polite musing…even if the Fourth Doctor finds Eight’s control room a bit ostentatious. The other Doctors in this tale do not meet up until the second episodes, but they still have plenty to do. Peter Davison’s Fifth Doctor is the one best suited to meet up with the owner and resident of 59A Barnsfield Crescent, mild-mannered, completely normal father of two Bob Dovie. The “face” of the quintet, Davison is polite but up front, and slowly takes charge of the situation without other people, including his fellow Doctors, realizing it until later on. Where the other Doctors deal with the fantastic situations they find themselves in, it’s Five that deals with the “normal” aspect of the story…which ends up backfiring in a spectacular manner, only for the Fifth Doctor to cause the backfire to backfire in his own unique way. Where the first episode belongs to the Fourth, Fifth, and Eighth Doctors, the second episode is the province of Six and Seven. Colin Baker easily takes center stage when he’s on screen. If there’s one thing I hope The Light at the End does for newcomers to Big Finish, it’s introducing them to just how awesome Colin Baker is as an audio Doctor. Brash, self-confident, and unable to help himself when someone verbally slights him in some way, it’s Six who discovers just how the Master obtained the means to pull off his dastardly plan and figures out a way to bring the Doctors together in time to fight back. Sylvester McCoy is the most subtle of the Doctors this time out. He’s definitely the most melancholy, as seeing Peri again sets off a twinge of nostalgia, a sensation that even a time traveler will never come quite to terms with. His exchanges with Six are of mutual respect and general curiosity, and it’s Seven who figures out the purpose behind the flashing red light in the TARDIS. The real joy is when near the end, for a period that was long enough and still made me wish it was longer, the five Doctors meet up to deduce what has happened and how to defeat the Master once and for all. As opposed to the bickering Doctors from The Sirens of Time, here the Doctors realize the thread and, aside from some comments about Six’s fashion sense, immediately get to work. It would have been tempting to add some The Three Doctors style bickering to the proceedings, but Briggs resists the urge and keeps the mood as jovial and light as one can in the face of total temporal collapse. The Light at the End is the story of the Doctor(s). In the grand scheme of things, the companions don’t contribute much to the advancement of the plot and they don’t have a lot of screen time before being removed from the story as an effect of the Master’s plan (ala what happened to the Fourth Doctor in The Five Doctors). Their removal, however, underlines the severity of the situation and only further push the Doctors to take action. Leela (Louise Jamsion) and Charley (India Fisher) get along swimmingly during their time together, and as Charley rants against the Master for kidnapping her, Leela dives into combat to hold off a group of robots. Peri (Nicola Bryant) gently needles the Doctor about his TARDIS driving skills as the fast, prickly pair of friends that they are and is genuinely thrilled and pleased to meet another Doctor, while Ace (Sophie Aldred), the younger version from the TV series, takes the concept of multiple Doctors in stride. After the Doctor explains the concept to her, her response is a simple, but appropriate, “wicked!” And Nyssa is the Doctor’s assistant while they investigate Bob Dovie and 59A Barnsfield Crescent. The companions are written true to their characterization (though it is a bit weird to hear Ace, who’s matured into Dorothy McShane in Big Finish, give an audio version of the “BOOM” scene from Battlefield) and only add to the story instead of coming off as forced into the plot and serving as a distraction. 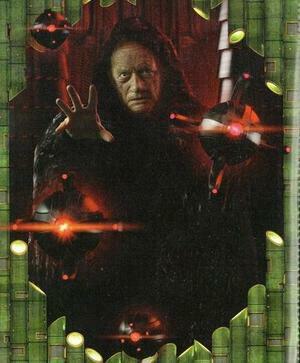 For the 50th anniversary, it’s only fitting that the Master take center stage as the story’s villain. Geoffrey Beever’s Master commits the ultimate temporal sin, crossing his own timeline in an effort to do something much, much worse than simply destroying the Doctor. As the Master in several Big Finish production, Beevers has been an absolute treasure to behold. At times, I wonder how things might have turned out if Beevers had been cast as a full-time Master instead of the (still awesome) Anthony Ainley. Beevers is coldly charming and utterly ruthless, mocking and taunting the Doctors every step of the way and not caring who gets hurt in his quest for revenge. And the indignation when the Doctors point out the possible flaws in his plan along with the smug superiority he feels when he politely chides the Doctors about trying to goad him into revealing his plan are just icing on the cake. Beevers’ Master was the perfect choice to act opposite the various Doctor, from his quiet introduction all the way to his impotent rage during his downfall. Bob Dovie plays a minor, but vital role in this story. One simple sentence from him kicks off the Master’s plan and nearly brings about the destruction of the entire universe. John Dorney plays Dovie straight; a man who has no idea of the bigger world around him, and one who goes utterly, utterly mad when the truth is revealed to him. His confusion and rationalization regarding the fate of his family, his reaction(s) to the inside of the TARDIS, and the humorous epilogue to the whole story could be any one of us if we ever truly experienced the sheer insanity of what passes for normal to the Doctor. The wider supporting cast is one that at first worried me, as I was afraid we were going to go both the cast bloat from Zagreus and the insult to the memories of Doctors who were no longer with us, ala Jon Pertwee’s “performance” in that serial. But Briggs manages to trim the proverbial fat while keeping the memory of those Doctors alive. Indeed, the First, Second, and Third Doctors are present in this story, but unable to fully materialize, ala the First Doctor in The Three Doctors. Described as “unearthly” and “transparent,” this allows William Russell, Frazer Hines, and Tim Treloar to play the those Doctors with voices that are just slightly “off.” Russell and Hines have portrayed the First and Second Doctors before in Big Finish’s line of Companion Chronicles, while Treloar is a Big Finish veteran from several other plays. The inter-Doctor bickering is present here, with Two and Three snapping at each other until One tells them to get on with it. If it wasn’t for the fact that the original actors who portrayed those Doctors have passed on, I wouldn’t have known the difference, that’s how spot on their mannerisms are. The performances are a sign of respect to William Hartnall, Patrick Troughton, and Jon Pertwee, and made me miss them just a little bit more than I already do. There is one moment that should make Big Finish listeners grin; the inclusion of Straxus from the Celestial Intervention Agency, aka the Time Lords “dirty tricks brigade.” Oliver Hume plays the secret agent, who has been featured in several monthly range stories and a good bit of the Eighth Doctor Adventures series. Straxus’ tactics allow the Master to get the upper hand, and he has to weigh the demise of the Doctor against the good of the universe. It’s Six who gets to admonish him in his own unique way. While casual listeners will easily understand who Straxus is after a few moments, longtime listeners will grin as the way the Doctor takes him down a peg. Now, while the casting and acting is spot on, and the script is solid enough, there are a few flaws with the story. Bob Dovie, for being listed in the synopsis, is barely in a tenth of the play’s runtime it seems. At times, the sound of the original three Doctors can be hard to hear, their dialogue lost to the ether thanks to otherwise solid sound mixing. And while HOW the Master’s plan comes to fruition, with one simple sentence, is unique, the rest of the story isn’t terribly original or innovative. But in the grand scheme of things, The Light at the End isn’t attempting to push the envelope or radically change the mythos of Doctor Who like Zagreus tried to do. Rather, it’s a bit of a “Greatest Hits” for the first 50 years of the franchise; classic Doctors, classic companions, callbacks and mythology gags that don’t overwhelm the story, and even a musical score that channels the best of Murray Gold with his overindulgence. Where Zagreus and Dimensions in Time fell short, The Light at the End is an absolute triumph that channels the best of Doctor Who with pride, allowing the classic Doctors a chance to show the revival Doctors that they still have a bit of life left in their regenerations! 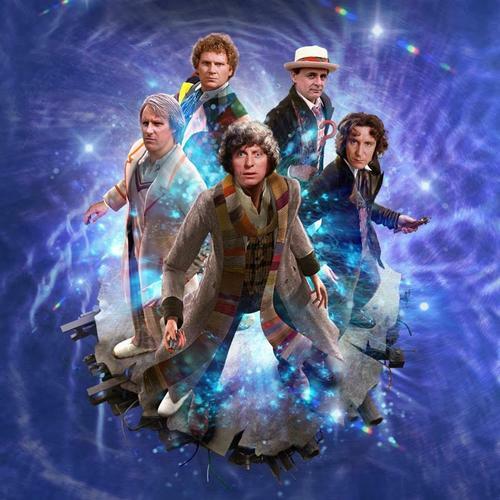 Synopsis – The Light at the End is the perfect story for the 50th anniversary of Doctor Who, as eight classic Doctors team up to fight the Master and celebrate the franchise. 5/5. Tom Baker is the Doctor in…Destination: Nerva. This entry was posted in Big Finish Review and tagged 5/5, Ace, Big Finish, Charley Pollard, Colin Baker, Doctor Who, Eighth Doctor, Fifth Doctor, Fourth Doctor, Leela, Nyssa, paul mcgann, Peri Brown, Peter Davison, Seventh Doctor, Sixth Doctor, Sylvester McCoy, TARDIS, the Master, Tom Baker. Bookmark the permalink.